Inspired by a recent question about tetrahedral kites, I found some 'spoon straws' at a local variety store. I gather the spoon bit on the end is used to spoon up ice slurry drinks. ) Joined two straws, part of one inside the other and stapled the spoon ends together. The unit length of each straw (cell side) was 31.5 cm. I used a short straw section internally to join cells and florist paper or paper-bag paper for the skins. Yesterday with the breeze gradually building I managed to fly it! The dimensions are just a fraction bigger than my Skewer tetra, so I guess it flies in quite a similar way. The straws must be quite light, possibly even lighter than bamboo skewers? I found my own little 4 cell design to be a bit fussy in flight. Only in 'just-right' conditions would it return really high and / or long flights. However, it wasn't super-accurate in construction, with some differences creeping in at the vertex joins. A 12-cell or 16-cell would still be dirt cheap, and fly a whole lot more stable. Speaking to myself as much as to anyone... 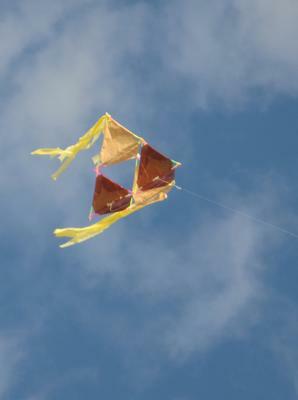 Such a kite would be a good reward for all the patient fiddly labor!